After apostates, another group of abusers are the spiritualizers. These are people who believe the Bible does contain prophecy, but they argue that it never means what it says. Instead, it means whatever they want it to mean. People love to spiritualize scripture because it enables them to play the role of God since they can use the spiritualizing process to make a prophetic passage mean whatever they want it to say. A good example of what I am talking about can be found in a book called The Millennium by the renowned theologian, Loraine Boettner.1 Since he was an Amillennialist who did not believe that Jesus would ever return to this earth to reign for a thousand years, Boettner had to spiritualize the meaning of Zechariah 14:1-9. That passage clearly and simply states that in the end times when the city of Jerusalem is surrounded by the forces of the Antichrist and is about to fall to him, the Messiah will return to the Mount of Olives. When His feet touch the mount, it will split in half. The Messiah will then speak a supernatural word, and all the forces around Jerusalem will be instantly destroyed. The passage closes by asserting that on that day, the Messiah will become "king over all the earth" (Zechariah 14:9). Boettner totally destroyed the plain sense meaning of this passage by cleverly spiritualizing it to mean something else. He argued that the Mount of Olives is a symbol of the human heart. Thus, the enemy forces surrounding Jerusalem represent the evil in the world that surrounds the human heart. When a person receives Jesus as his Lord and Savior, his heart (the Mount of Olives) breaks in contrition, and on that day, Jesus becomes the king of his life. So, the passage has nothing to do with the Second Coming of Jesus. Instead, it is a passage about individual salvation! I grew up in a spiritualizing church where we were taught that the Bible never means what it says when it is speaking prophetically. Because we spiritualized prophecy, we were Amillennial in our eschatology, denying that Jesus would ever return to reign on this earth. Our preachers seldom ever spoke about Bible prophecy, but when they did, they would always confidently proclaim, "There is not one verse in the Bible that even implies that Jesus will ever put His feet on this earth again." That was our prophetic mantra, and I heard it over and over again. So, you can imagine how shocked I was one day when I was about 12 years old and was flipping through the Bible, and it happened to fall open to Zechariah 14. It was easy to read and simple to understand. The message was clear: the Messiah is returning to the Mount of Olives, and when His feet touch the ground, the mount is going to split in half. I couldn't believe my eyes! The next time I went to church, I confronted my pastor in fear and trembling with the passage. I reminded him of his teaching that "there is not one verse in the Bible that even implies that Jesus will ever put His feet on this earth again." I then showed him Zechariah 14 and asked him to read it. He did so — over and over. Finally, after what seemed like an eternity, he looked up at me, stuck his finger in my face, and said, "Son, I don't know what this passage means, but I'll guarantee you one thing, it doesn't mean what it says!" When I asked why, he bellowed, "Because it is Apocalyptic!" I didn't know what that meant, but it sure sounded authoritative, so when I started preaching in my 20's, I used the same technique to put down anyone who would question my assertion that Zechariah 14 did not mean what it said. I would just growl, "It's Apocalyptic!" The Messiah will come humbly, riding on a donkey (9:9). He will be hailed as a king (9:9). He will be betrayed by a friend (13:6). He will be betrayed for 30 pieces of silver (11:12). The betrayal money will be used to purchase a potter's field (11:13). The Messiah will be forsaken by His disciples (13:7). The Messiah will be pierced (12:10 & 13:6). After discovering these prophecies and realizing that they were all literally fulfilled in the life of Jesus, it suddenly dawned on me that if the First Coming prophecies in Zechariah were literally fulfilled, then there was no reason to assume that the Second Coming prophecies in the same book would not be literally fulfilled. 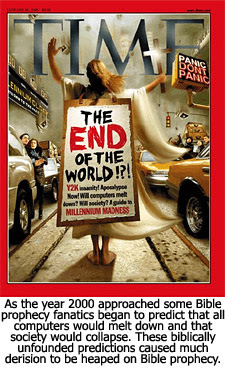 I realized that "Apocalyptic" was nothing more than a smoke screen to hide the true meaning of the prophecies. Unlike the apostates and the spiritualizers, the fanatics truly believe in Bible prophecy to the point of being obsessed by it. Where they go astray is that they view prophecy as a playground for fanciful speculations. You can spot a fanatic easily. They are always trying to guess the identiy of the Antichrist or else they are attempting to set a date for the Lord's return. Edgar Whisenant is a good example. In 1987 he published a little pamphlet entitled "88 Reasons Why the Rapture Will Be in 1988. "2 Over 300,000 copies of 88 Reasons were mailed free of charge to ministers across America, and 4.5 million copies were sold in bookstores and elsewhere. When 1988 came and passed without the Lord returning, Whisenant wrote another pamphlet giving 89 reasons why the Lord would return in 1989! One characteristic of prophecy fanatics is that they never learn from their mistakes. The classic example is Harold Camping who owns one of the largest Christian radio networks in the United States.3 He used that network to proclaim his conviction that the Lord would return in 1994. Did he learn his lesson? No! In 2010 he cranked up his procrastinating machine once again and set another date for the Lord's return: May 21, 2011. And when nothing happened on that date, he proceeded unabashed to revise the date to October 21, 2011. Needless to say, the fanatics do great harm to Bible prophecy. Their reckless speculations produce disillusionment and mocking. They cause the whole study of Bible prophecy to be held in contempt. In the next part of this series looking at the abuse of Bible prophecy, we'll see how Satan has convinced even Christian leaders to ignore its study. 1) Loraine Boettner, The Millennium (Phillipsburg, NJ: P & R Publishing, revised edition, 1990). 2) Pamela Starr Dewey, "Edgar Whisenant's 88 Reasons," www.isitso.org/guide/whise.html. 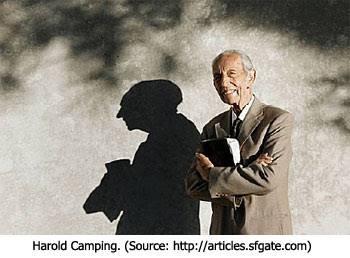 3) Alyssa Newcomb and Lyneka Little , "Harold Camping: Doomsday Prophet Wrong Again," http://abcnews.go.com/blogs/business/ 2011/10/harold-camping-doomsday-prophet-wrong-again. I have recently learned that in Jesus time Kings rode on donkeys. Literal for them for us in modern times not so much. We need to study the Word of God and also understand the times it was written. Time has helped satan out a whole bunch. Jesus feet on the mountains means his dominance over the world and governments of the world, but Jesus will physically and literally be there/here. Our God is so above man's intelligence but we try to explain him with that alone. We need to realize the truth of God is in the heart not the head. Keep preaching brother, one day the head will catch up with the heart of all things. QUOTE “The poem below was written by a Muslim mystic – a woman by the name of Rabia al Basri (717-801). She was a native of Iraq. Normally, we would not publish anything by a Muslim spokesperson. But this little poem contains a profound insight about God. Read it carefully and think about it. If I adore You out of fear of Hell, burn me in Hell. Do not deny me Your eternal beauty. I find this to be completely inappropriate. This is not a poem to the God of Abraham, Isaac and Jacob. It is a poem to Allah. The talk of paradise…the one with the 72 virgins? Asking to be sent to hell and locked out of “paradise” (the Muslim one?)? Saving only save me if my love for you is “proper”. I think Lamb & Lion made an error is printing this MUSLIM poem to ALLAH by a MYSTIC. It should be officially retracted by Lamb & Lion. If you agree, please let them know. If not…I would love to know why not? That is, current issue of The Lamplighter, March-April 2012, page 17. Sorry for my misspellings...I was a bit flustered. I love the Lord because is saving me from hell...I don't want to go there becasue I love Him for that. I love the Lord for the eternal life in the Christian paradise and all it's rewards...I don't want to not go there because I love Him for that. I love the Lord for what he did for me unconditionally...not based on whether my love of Him is "proper" or not. Billy I checked it out, thought about it, and I agree with you! Its mixing light with darkness, and Christ with Belial. A quick Google search on Rabia al Basri (717-801) shows the following in the summaries (I didn't go to the actual webpages). she is greatly revered by devout Muslims and mystics throughout the world." "Rabi'ah al-Adawiyya, a major spiritual influence in the classical Islamic world,"
"She was regarded as the first female saint of Sufism, the mystical tradition of Islam." Lamb & Lion...someone made a big mistake via publishing that Islamic mystic poem in The Lamplighter. Please let us know you realize it was a mistake and make a retraction. Hi billy, i read that lil section in lamp lighter with the poem by the muslim spokesperson rabai al basri. I agree with u and sue and also i would like to know exactly what the "profound insight" is. Except for this re. Rick Warren! ** IF** you abide in the vine… KNOWING what to do so that we can grow to maturity in the living vine that is Christ, and actually APPLYING it to one’s life … aah! Now there’s the rub.! RW and his CEO’s talk the talk but don’t walk the walk – in the Holy Spirit, for if they did, they would repent from their New Age, Postmodern, pseudo science of psychological ‘counselling’, CROSSLESS message that will dam their hearers to hell fire. The meaning of God’s inerrant word aka RW is arrived at by a good chat and a final consensus of opinion. When I said to my son of 40 yrs ‘You shall know the truth and the truth shall set you free’ He told me that was just MY opinion!!! The bountiful, harvest that Rick Warren is invoking is spiritually withered and fit only for the burning. The HUGE numbers are in itself evidence of Apostasy. ‘Look at all the people mum’ cries my precious but deceived son ‘ it’s WORKING’! ‘Look at what we are doing. Huh what are YOU doing? It is a waste of life sitting in the back room reading Revelation and checking with Greek and Hebrew. Reading DOCTRINE will send you insane. WE CAN NEVER KNOW THE TRUTH!" I’m his mother, and he has consigned my worth to the dustbin. I have not EARNED his respect. He has ditched me as surplus to requirements due to the marriage ‘counselling’ he obtained via Simon the Magician CEO. I am too upset to spell out here the where and why of this fabricated, wicked interpretation with its twists and turns. My son is afraid to allow me to explain by Biblical Interpretation. His mentors and the devil NEED to keep him away from me – I am divisive – they have worked a long time to get the ‘crap’ out of him that I taught him from a baby. Of course that means I must have no contact with my grandchildren in case I tell them the TRUTH and upset them. Big numbers is never evidence of GOD working. Within Acts, the Holy Spirit worked slowly and steadily to produce a quality REMNANT. Unlike Rick Warren’s teachings, the local Church did nothing! The Church grew as a direct result of the Holy Spirits working. Jesus said ‘I will build my Church’ and the Church is expected to preach the Gospel of the crucifixion, death, resurrection and ascension of Jesus Christ AND His return for His Body/Bride. Believe in the Lord Jesus Christ (the one we have told you about – blood and gore) and you WILL be saved. If not, then people remain condemned and they will later reside in the Lake of Fire prepared for the devil and his host. Rick Warren says Jesus is wrong about this, talk of the cross and hell upsets folk. Can’t you see L&L that Rick Warren is teaching Another Jesus and Another gospel? It is the enemy who presents big numbers, like when he tempted David to defy God and numbered Israel (Pride). God works with a quality REMNANT! Repentance is now a dirty word, a word to scoff and sneer about and thereby we KNOW the vast majority of Rick Warrens Lemmings are out of fellowship with the Heavenly Father. Unless Rick Warren repents of his fleshly works to build God’s kingdom for him, then he remains out of fellowship with God – and that is a fact! 1John 1:9 is waiting! I remain stunned that L&L has no issue with Rick Warren other than his rejection of prophecy. Rick Warren can deny Universalism till the cows come home – what he is actually producing IS Universalism. He can acclaim The Bible as God’s inerrant Word till he is blue in the face – ACTIONS speak louder than words as Rick Warren manipulates Scripture to fit his latest ideas. Rick Warrens WORKS and FRUITS are evidence that he is a deceived deceiver; as are all his followers. You are right about what is proper. I have seen this page use a mormon person to make their point too. I was rebuked by the young man who runs this. The end never justifies the means I believe. I also believe that the Lord has given us so many good christian examples that we need not be reduced to false religionists examples. 1 Thessalonians 2:3-4 For our exhortation was not of deceit, nor of uncleanness, nor in guile: But as we were allowed of God to be put in trust with the gospel, even so we speak; not as pleasing men, but God, which trieth our hearts. I am so afraid of sad sentimentality and an emotional appeal being put on us instead of the Gospel of Jesus Christ. You are right. L&L needs to explain what the "profound insight" is from an Allah believing Muslim mystic about the one true God that we Christian should understand or care about. I hope we get a response soon. Everytime I look at that Muslim mystic poem I just wonder "L&L, what were you thinking???!!!" Nathan, please let us know what we are not seeing in this "poem". Im totally disappointed. And very much hoping the insighg u will provide will clear this up. Sorry... .... "insight" i meant to type. why is lambandlion not answering your concern about the mystic poem? are they ignoring hoping you'll go away? do they think your question is ignorant or not PC? it is not good for the teacher/preacher to ignore thier flock? Sue, i will be in prayer for ur son. My heart aches for u as i understand what is to try and open eyes of r loved ones to the TRUTH of the gospel. Rick is NOT conducting himself as a proper Chrisgian leader and as a result has led many astray to apostacy. this is a reason why i have laid off on blogging. We r repromanded for "having church" here. Hmmmmmm..... i dont get it. I'll give Nathan the benefit of doubt. He is involved in the TV show production and upcoming conferences so he may just be busy at the moment. But I NEED to see a response eventually. I read on pg 14-15 an article trashing the incidents of Chrislam, that is the melding of Christianity with Islam. Then on pg 17 you get a beautiful Christian poem...but underneath that you get an offensive non-sensical Muslim mystic poem with L&L commentary saying we can find insight from it. Insight from a Muslim poem giving insight on the Christian religion? Sounds like Chrislam to me. Can anyone imagine praying to Jesus that you WANT to burn in hell and be BANNED from Heaven if you didn't love Him PROPERLY? Burn the witch! Burrrnnnnn the witch! Dr Reagan turned me into a newt... but I got better. Some of us believe L&L when they say they WANT to be held accountable to those that follow this ministry by being good stewards of our money and true to the Word of God. If you don't care that L&L prints Muslim mystic poems to Allah that is your choice. But don't put the rest of us down for asking questions, asking for clarification and expecting some accountability to those that have place some trust in and donate money to this ministry. Billy et al, I'll pass your concerns onto Dr. Reagan and wait for his reply. Really, though, his paragraphs before and after to me explain it all, and along with the article on Chrislam there should be no worries that we're all the sudden linking arm-in-arm with Islam. I'm sure we didn't mean to offend you. Nathan said: "Really, though, his paragraphs before and after to me explain it all,"
What exactly is the "profound insight" in a poem about Allah by a Muslim mystic woman? And to be accurate, I said the Muslim mystic POEM to Allah is offensive, not L&L. What I said was L&L made a mistake/error (in my opinion) in printing it WHILE ALSO trying to get some Christian insight out of it (hence the Chrislam comment...Muslim mystic poem to Allah equals profound insight about Christian God). I KNOW L&L is NOT going Chrislam and it still has my support. Some clarification, either that offers a good, clear explaination of the "insight" that we can all say "oh, now I understand" or an admission of it was a mistake would be appreciated. p.s. Email is terrible in that it does not express tone or frame of mind. My tone is civil and my frame of mind is L&L is a wonderfully blessed and invaluable ministry which I wish no ill will to. Nathan, i agree with billy that we still stand behind you, but seriously, its a little odd to me that u moved the issue aside and said u would wait for dr reagans reply. We just want to know what pround insight we have all overlooked. At best, having the article written about a false idol is a complete lack of wisdom. At worst, it is a creeping in of chrislam. I believe that often one can get so into teaching, tv programs, running ministries etc., that we forget that we are just average people and that our adversary is roaming around seeking whom he can devour. One can get so insulated as the teacher/leader/prophet that whatever one says is ok. One must be on guard. There is another thought. One can try so hard to say something inspiring, be clever or sound profound when it is really the leading of man (flesh) and not the Holy Spirit. 1 Cor 2: 4-5 And my speech and my preaching was not with enticing words of man's wisdom, but in demonstration of the Spirit and of power: That your faith should not stand in the wisdom of men, but in the power of God. Stick to the scriptures and quit trying to show how insightful one is. The only insight we need is from the real God. Stick to the Word. If you run out of things to say due to having journals, blogs, tv shows etc., just ask God to give you instruction. John 21 :25 And there are also many other things which Jesus did, the which, if they should be written every one, I suppose that even the world itself could not contain the books that should be written. Amen. Since we don't know what is going on here...that leaves speculation. I can see where Nathan may be careful in repsonding to something Dr. Reagan wrote (hence, I have to check with him). After all, Reagan IS his boss. "...Or is it motivated instead by a desire to avoid Hell?...or do you view Him as a Cosmic Sadist who loves to torture people?...or are you trying to find an eternal fire insurance policy?..." It is possible the "profound insight" Dr. Reagan found in this Muslim mystic poem is it supports his belief that hell is not an enternal torment but an eternal punishment. "...The traditional view holds that Hell is a place of eternal, conscious torment."... "Another point of view — the one I hold — takes the position that immortality is conditional, depending upon one's acceptance of Christ. I believe the Bible teaches the unrighteous will be resurrected, judged, punished in Hell for a period of time proportional to their sins, and then suffer destruction (the death of body and soul)." "My first difficulty with the traditional view is that it seems to impugn the character of God. I kept asking myself, "How could a God of grace, mercy and love torment the vast majority of humanity eternally?" It did not seem to me to be either loving or just. I realize He is a God of righteousness, holiness and justice, but is eternal suffering justice? The concept of eternal torment seems to convert the true God of justice into a cosmic sadist." "...or do you view Him as a Cosmic Sadist who loves to torture people?..." "The concept of eternal torment seems to convert the true God of justice into a cosmic sadist." So, it APPEARS to be POSSIBLE, since no one will tell us, the "profound insight" is the Muslim mystic poem supports Dr. Reagan's ideas that hell is "an eternal punishment" than than "an eternal torment". I honestly did see Dr. Regain made good points in his article arguing for hell being an eternal punishment, not an eternal torment, but now, seeing he finds support for this view in a Muslim mystic poem to Allah, I have to reconsider. "We must also remember that our beliefs about the duration of Hell are not on the plane of cardinal doctrine. Sincere, godly Christians may study the same scripture passages about Hell and end up with differing conclusions about the issue of its duration. Our varied viewpoints, arrived at through earnest and godly study, should not be allowed to cause division or rancor in the body of Christ." Division or rancor ARE NOT my objective in this post. My objective is CLARITY. That's all. A simple question. What IS the profound insight? Most of us on AR-Talk can vouch for Dr. Reagan as a solid apologist and no compromiser with Islam or Mormonism. I am a former Mormon who has been a repeat guest on "Christ in Prophecy" to refute Mormonism, SDA, New Age, etc. At his last conference he asked me to address the Word-faith error. If we mistake favorable quotations with endorsements we might end up condemning Paul on Mars Hill for quoting Epimenides of Crete and Aratus' "Hymn to Zeus" (Acts 17:28). I used the poem to teach Christian principles. There is absolutely nothing wrong with that. I could also quote an atheist to teach Christian principles, something I have done several times in the past. In like manner, Paul quoted heathen writers to make his points about Christ. Furthermore, in this instance, there is not one thing wrong with the poem. I'd like to add my growing concern for the state of the brethren in these end times. As you know, I answer all the correspondence for the ministry as well as on Facebook, Twitter and here on the blog. I also am deeply involved in the Bible prophecy teacher circles of discussions. And, I've noticed something worrisome. We've all been beaten and bruised and hurt by various teachers and churches falling into apostasy. We see it everywhere. But, the sad result is that we've become hyper-sensitive to anything we might think even has the whiff of questionability, whether it even does or not. I'm concerned that the devout are quickly becoming like some well known teachers who now spend all their time attacking the Church rather than fending off the spiritual forces of this world (Eph. 6:12). We've all fallen into this trap at time to time, and the result is that those who watch from the outside see only anger and "hate" and a form of spiritual cannibalism. We hurt the testimony of Christ when we become like this. I do apologize to you all when I can become like that, and pray I'll keep the fight on the enemy and not with the brethren. so lightness now has fellowship with darkness as long as you can use it and an illustration. Plus the authority used to rationalize his use of darkness is a man (walker) and not the word of God. I notice how we watch each other backs. With all these so called discernment ministries calling out others that are not themselves or buddies, I wonder if we forgot where judgement really starts. The bible tells us where. In the house of God. Nathan, this is NOT an attack on Dr. Reagan. In fact your post says "Most of us on AR-Talk can vouch for Dr. Reagan as a solid apologist and no compromiser with Islam or Mormonism." I'm sure I can safely say ALL OF THE REGULARS HERE, not just MOST OF US, would say Dr. Reagan is a solid apologist and no compromiser with Islam or Mormonism. We still don't have an answer to our question. WHAT IS THE PROFOUND INSIGHT???!!! However, if you read on Acts 17:29 says "“Therefore since we are God’s offspring, we should not think that the divine being is like gold or silver or stone—an image made by human design and skill." So, Paul uses the words of the poets of the ungodly people to show them their beliefs about God are WRONG. He does not say their poems display any insight on the one true God. Dr. Reagan does the opposite. He uses the Muslim mystic poem to show how Rabia al Basri's beliefs about Allah are insightful and DO dsplay insight on the one true God. The issue is not whether the Muslim or aethist or whatever should be used to teach Christian principles. The issue is, as has been stated SEVERAL times now, WE DONT UNDERSTAND what the "profound insight" is we were supposed to get from the poem. Paul explained his point in Acts 17:29. The article left it to us to figure out..."Read it carefully and think about it." Well, we've read it carefully, thought about it and don't understand. PLEASE tell us the point you were trying to make. That will be my last post on the subject. I'm afraid this whole thing is starting to blow out of proportion and cause hurt, never the intent of anyone here. A simple clear response early on would have avoided this whole unpleasantness. So out of Nathan's plea for peace amoung we fellow Christians, I'm accepting Dr. Reagan's and Nathan's posts and dropping the whole thing. It is becoming a harmful distraction which, again, was NEVER the intent in the first place. Nathan said "We've all fallen into this trap at time to time, and the result is that those who watch from the outside see only anger and "hate" and a form of spiritual cannibalism." Let no one on the outside think there is any hate here with us. We are united together as believers in Christ for our salvatin and we stand together for eternity united in our love for our Lord Jesus Christ and for each other! I have Christian brotherhood love for Dr. Reagan, Nathan, Sue, Susie, Rodney, DrNoFog, and all our Chrisitan brothers and sisters everywhere. Let NO ONE mistake passionate discussion for hatred. DON'T YOU EVER COME HERE LOOKING FOR DIVISION IN THE RANKS...you'll never find it HERE! We are united together in Christ. Many see a call for accountability as a personal attack. They usually give a flippant remark or try to make the one who asks for accountability into a hater'divider (although their ministry calls out others by name).I see a double standard due to self-importance. I understand that you were/are being civil. It is just some believe they are higher in the kingdom and because of their place/ministry are always in the right. Just never call them into accountability unless you want to see less than civil behavior usually. I also refused to be guilted into backing away from asking for accountability. Many seenm to do that when they are asked for accountability. This is also a civil, but forthright post. I will stand by my decision to drop out of the discussion at this point. That doesn't mean others can't continue it at this point. I'm not going to comment on the matter anymore because one...I said I would and two...if this continues I could begin to have negative feelings towards L&L and that is not where I want to end up at. Dropping out of the discussion, however, does not mean I retract me concerns, comments and questions nor feel anything I said was inappropriate in any way. If there was no resolution and this point I don't see any reason to continue. Thanks and God bless you all. No hard feelings or negativity to anyone including Dr. Reagan and Nathan. I still love L&L. So, Paul uses the words of the poets of the ungodly people to show them their beliefs about God are WRONG. He does not say their poems display any insight on the one true God." Actually, I CAN see where Paul uses the words of the ungodly poets "We are his offspring" to turn it around as an insight about God. So, I was WRONG in that post. Since I was WRONG, I was forced to correct myself. I am in total agreement with Billy and Susie’s comments that are eloquent, reasonable and respectful. Billy, I have to chime in and agree with you on this too, but I do have to point out one little boo-boo in order to make my point. "...So, Paul uses the words of the poets of the ungodly people to show them their beliefs about God are WRONG. He does not say their poems display any insight on the one true God..."
Paul had also just previously quoted one of their philosophers saying "...in Him we live and move and have our being...", which is a revelation of 1 Kings 8:27, that "...the heaven and heaven of heavens cannot contain thee...", that God is the All in All, that He is greater than, and cannot be contained within His own creation, and that there cannot be anything "outside" of God. He then goes on to quote another, saying: "...‘We are his offspring.’..."! Since he does NOT condemn either one, it serves no purpose to quote stuff at random, unless the alternative is confirmation, and he confirms both, in saying: "Therefore since we are God’s offspring..."
This is absolute confirmation of the doctrine that he later lays out in Romans, that fallen mankind is not with a built-in witness, a revelation of His Majesty and Righteous Sovereignty over His whole Creation, "...so that they are without excuse..."
He was operating under the inspiration of the HS. I don't think Dr.Reagan will make that claim on this apparent faux pas. And in conclusion, I agree with you Billy, that this is a difference of opinion, and is NOT a division worthy of any note for on-lookers here. Glad you posted anyway as it was a very good one. The insight about God I get out of the poem is summed up in Dr. Reagan's last statement on page 17 - "The only proper relationship with God is to fall in love with who He is - our Creator and Savior." The poem's author didn't want to know God wholley based on her fear of Hell or desire for Heaven, but to love God for just who He is. Her God is not Jehovah God, but she has nailed what our relationship should be all about with our Creator. You all really didn't get that? Let's be honest, for all I read was rage over the poem being written by a Muslim. Now I'm commenting on the answer so I feel free to speak again. You are really suprised we Christians didn't get an inspirational insight from a Muslim mystic Allah poem saying "burn me in hell and keep me out of paradise unless I don't love you, Allah, for you yourself alone". Really? Seriously? And a Muslim mystic poem about Allah "nails" what our relationship about God should be? I adore you for saving me from Hell. I adore you for preparing a place for me in Heaven. But most of all, I love you as Creator and Savior. Billy so sorry your having a hard time getting a straight answer about the mystic poem. Just don't faulter on your passion for seeing apostasy. On another thread you had asked about Joyce Myers. By accident today I heard her preaching and in the middle of a statement on being a steward for God she called God the All Seeing Eye. This is very odd and was so sublte. You wouldn't even notice it if the Holy Spirit within you didn't have its ears open. So keep your ears, eyes, heart and mind in tune with the Lord. You have a true sense of what is apostasy. God Bless! Allah does not represent the God of the Bible, Allah is the crescent moon god found upon flags, minnarets, mosques, and banners of Islam! I agree with Billy that we must stand united as brothers and sisters in Christ always keeping watch, exhorting, and rebuking those in error! Accountability is a must in these Last Days!!! @Friend, we've given a straight answer from every angle possible. It's the word "Muslim" people seem to can't get past and then it colors their whole reading of the poem. Like I stated earlier, a hyper-sensitivity (and I'd add hyper-reactionary) response to anything that doesn't have the Christian label on it and then the subsequent plunge into fear that another ministry's gone apostate. Wow, Nathan, thanks for the response. We are very sensitive to the muslim curriculum right now. It's because we just don't get what their agenda is. I just think in these sensitive times that we are all seeing the apostasy sneaking in everywhere and just want to make sure everyone is on the up and up. Sorry if my post sounded like this sight was bad, I meant the poem, of course. God Bless! Take away the word Muslim? That's like saying take away the name Hitler from the holocaust and it will be more appealing. Putting a Christian label on the poem wouldn't make it any more appealing to me. Jesus, send me to hell?! Jesus, lock me out of Heaven?! Satan would like to disguise himself in the attributes of God as just another way to deceive, hence the constant use of "Allah the merciful" when, in fact, he is a merciless, sadistic murderer. It should come as no surprise then, that he would channel thru a 'mystic' to off-load something that is supposedly 'godly' and virtuous sounding to the world but dedicated to himself. And all the while there is this nagging undercurrent of fear that they have not done enough to assuage Allah's anger at them, according to a lot of converted Muslims. Learning to love Him is what the HS teaches best, -even wrote a whole Book on it! Nathan said "...and then the subsequent plunge into fear that another ministry's gone apostate." We don't think that just because we have a disagreement here. L&L is one of the few ministries left that isn't apostate. You KNOW that is how we feel about L&L. Now, if I see Muslim mystic poems keep poppin up in the Lamplighter in the future...well, then the fear may exist in reality. Your comment "And all the while there is this nagging undercurrent of fear that they have not done enough to assuage Allah's anger at them, according to a lot of converted Muslims." is EXACTLY what I got out of the poem. Thank you for articulating what I did not. And your comment about Jude v.23 is a good point, too. Nathan said "...Let's be honest, for all I read was rage over the poem being written by a Muslim... & ...It's the word "Muslim" people seem to can't get past and then it colors their whole reading..."
"...colors their whole reading..."... - ?Really? But Nathan keeps digging the hole deeper! Nathan, seriously!?! Aside from the occasional "rock-throwing Anons" that happen thru here wif weird accusations, what does that insinuate to all the rest of yer regulars?!? EI said it best! : "...I am in total agreement with Billy and Susie’s comments that are eloquent, reasonable and respectful..."
Our major concern was for Dr.DR! Did he slip on a banana peel & ding his head a little bit that day??... But now we also hafta start worrying a little bit about you too! "...It's the word "Muslim" people seem to can't get past and then it colors their whole reading..."
Nathan!! In all my short yrs here, that has to be the weakest argument that I have ever seen you come up with!! I know you can do better! Billy nailed it correctly "...Take away the word Muslim? That's like saying take away the name Hitler from the holocaust and it will be more appealing..."
Since Christianity is NOT a "religion"... but, is in fact, a real restored, direct "personal relationship" with God, -- as opposed to ALL THE OTHER "RELIGIONS" OF THE WORLD, ie., Satan's various other substitutionary forms of ritualistic rigmarole, started by Cain, to hide his failing fellowship with God,... "religion"...is what it is... Fakery! "...It's the word "Satanism" people seem to can't get past and then it colors their whole reading..."
"...It's the word "Witchcraft" people seem to can't get past and then it colors their whole reading..."
Well this is a very interesting and comforting web site. The important point to take in about any prophecy is that a person has been in the presence of angels, when trying to decode a prophecy in the bible you first must ask the father in heaven to enlighting the spirit within one self. If you are meant to understand it the angels will guide you. Anonymous said "...If you are meant to understand it the angels will guide you". Naw! we give all fallen angels and angels of light the toe of our boot! We go DIRECTLY to God The Father, in the name of Jesus Christ and they send the Holy Spirit to tutor us personal like. Sometimes we don't pay enough attention due to them same rotten angels twittering in our earholes, so it takes us a while to cotton on to hear what the Lord God is actually saying to us. You are correct – there is only one Creator God and His Name is YHWH and He has only ONE begotten Son named Yeshua (Jesus). The god of Islam is named Allah and Allah HAS NO SON! So obviously YHWH and Allah are not one and the same at all. A Muslim is NOT my brother because we do not have the same Father. "For God so loved the world that He gave His only begotten Son, that whoever BELIEVES in Him should not perish but have everlasting life. "For God did not send His Son into the world to condemn the world, but that the world through Him might be saved. John 3:16,17. Our Heavenly Father commands us to love men everywhere and give them the good news of Salvation from sin through Jesus Christ. Jesus died as our substitute on a cross of shame and three days later He was resurrected from the dead and is now seated at the right hand of God the Father in Heaven. IF we put our faith/trust in Him, He will wash us clean from the guilty stain of sin freely and without cost to us. He does not – ever – command us to fight Muslims. He wants them to trust in His Son and become adopted into the royal family of God. It is Apostate christianity that starts fights for power, land and wealth. Anonymous – Jesus loves YOU and wants to save you from the wages of sin which is death. We all want you to know this Truth so you can become our brother/sister in Christ Jesus. Oh, no, Anonymous, Mohammed and Universalist teachers have got it wrong. The whole Unitarian argument dies at the Creation "in our image" (Gen. 1:26), Jesus' baptism (Matt. 3:13-17), Transfiguration (Lk. 9:28-36), and Crucifixion (Mk. 15:33-34), among other references. The Bible is full of evidence that God is one entity in three separate and distinct parts. Check out the main verses in the Bible concerning the Trinity which are Genesis 1:25-26; 11:7; Isaiah 6:8; Zechariah 12:10; Luke 1:35; 3:21-22; John 14:16-17, 26; 15:26; 2 Cor. 13:14; Col. 2:9; and Phil. 2:10. Anon! i am not sure i understand what it means exactly when u said..... all humans created by him are his flock....?????... im not tryin to sound stupid, i m just wanting to understand. i agree with sue that we all want u to be our brother/sister in Christ. AMEN!!! Billy, I thot you already knew that the '72 virgins' wuz an ancient scribal error in copying the Arabic manuscripts [about 800 AD] and no one had the guts to correct it cuz it sounded so good [for the terrorist "martyrs", of course]. The original Arabic reads: "...a 72 yr old virgin..." [as in 1]!! Now about this 72 year old virgin...! Quote "...Billy, I thot you already knew that the '72 virgins' wuz an ancient scribal error in copying the Arabic manuscripts [about 800 AD] and no one had the guts to correct it cuz it sounded so good [for the terrorist "martyrs", of course]. "Oh, no, Anonymous, Mohammed and Universalist teachers have got it wrong. The whole Unitarian argument dies at the Creation "in our image" (Gen. 1:26), Jesus' baptism (Matt. 3:13-17), Transfiguration (Lk. 9:28-36), and Crucifixion (Mk. 15:33-34), among other references. The Bible is full of evidence that God is one entity in three separate and distinct parts..."
Unitarianism is the belief that God exists in one person, not three. It is a denial of the doctrine of the Trinity as well as the full divinity of Jesus. Therefore, it is not Christian. There are several groups that fall under this umbrella: Jehovah's Witnesses, Christadelphianism, The Way International, etc. Another term for this type of belief is called monarchianism. There is a group known as the Unitarian Universalist Association. This denomination which was formed in 1961 in the United States when the American Unitarian Association and the Universalist Church of America merged. Its membership is around 175,000. The General Convention of the Unitarian Universalists formulated the five principles of the Universalist Faith in 1899. Salvation is by grace through faith and not by works in any way. Jesus became the Son of God at His baptism. The Holy Spirit is not a person, does not have a will, etc. There now is and will be rewards and punishments according to one's actions but this does not consist of the traditional doctrine of hell. Human reason and experience should be the final authority in determining spiritual truth. This last point, "Human reason and experience should be the final authority in determining spiritual truth," is perhaps the most revealing of the character of Unitarian Universalists. Instead of God and his word being the final authority on truth and error, or right and wrong, Unitarian Universalists subject God and his word to their understanding, feeling, and reason. Notice that each of the five statements begins with "I want..." This is not the humble attitude of one indwelt by the Holy Spirit of God. It is not the attitude of one who wants to put God first. It can plainly be seen that this is a religion based upon personal hopes and desires and not upon the the Bible. Many commentators believe that these five "I wills" were uttered by Satan as he sought to be exalted and equal to God. They reflect the arrogance of the evil one as his heart was filled with pride and put his own will before God's. He had his desires before God's. "Nevertheless you will be thrust down to Sheol, to the recesses of the pit." Jesus said, "Out of the abundance of the heart, the mouth speaks," (Matt. 12:34). We can see that the Unitarian Universalists speak first from their own desires, according to their own wisdom, and not according to the wisdom of God. What does God say about this? "For the wisdom of this world is foolishness before God," ( 1 Cor. 3:19). 2Cor11: 4 For if he who comes preaches another Jesus whom we have not preached, or if you receive a different spirit which you have not received, or a different gospel which you have not accepted--you may well put up with it! Bible scholar Joseph Henry Thayer, inspite of his Unitarian background did not compromise the Scripture’s teaching on the full deity of Jesus Christ when he wrote his classic reference book, “A Greek-English Lexicon of the New Testament” published by New York American, 1889. Well I never did! I didn't forget that bit of info. I didn't know it in the first place - AND - I own and use his dictionary. Certainly the man was honest, but seemingly he was wilfully ignorant with it! Interestingly it does say in the U-nit 'rules' that it is fine to have a 'change of mind', which is repentance - which he wouldn't do - oer! Too late to pray for him, but hopefully 'our' Anonymous will quickly drop their 'angels' lies to quickly 'know The Truth'. As a drive by reader, I was astounded by Nathans response. I think Billy and Sue and also Rodney were right. Nathan this time you were wrong and taking correction in regards to the islamic poem would have been the right thing to do as a leader in this ministry. I am one of the lurkers who read this blog but do not comment and felt that I must in this instance. The use of that poem was misguided and your defensive hostile response was not humbling. Remember we are all part of the church and we sharpen one another in love.